Please wear comfortable clothing as we will be sitting cross-legged on the floor for meditation. 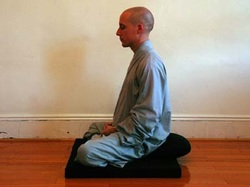 If you cannot sit cross-legged you can meditate sitting on a chair. The Dharma Drum Eight-Form Moving Meditation was developed by Master Sheng Yen of Dharma Drum Mountain as a means of allowing people living stressful and busy lifestyles to enjoy some of the benefits of Chan meditation. The system, based on many years of practice and personal experience, has incorporated the essence of Chan meditation into a series of simple physical exercises. In addition to physical exercise, practice of the Eight Forms helps you relax your body and mind, so that you can develop a healthy body and a balanced mind. There are 2 versions of the Dharma Drum Eight-Form Moving Meditation, from a standing posture and from a sitting posture. We use the standing form at Morning Group Practice every Sunday.